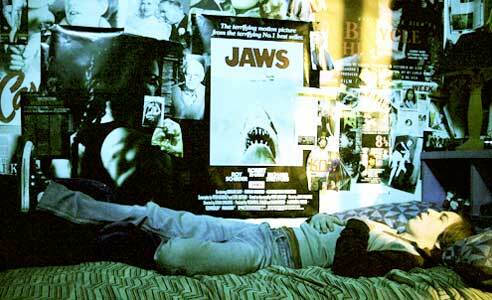 Michael Angarano wears black high top Converse “Chuck Taylor” All Stars in the film. Cameron Kincaid dreams of becoming a great film director. When Man in the Chair opens, we are introduced to the two main characters, Cameron Kincaid (Michael Angarono), a high school aged aspiring filmmaker, and Flash Madden (Christopher Plummer), a bitter retired gaffer living in a film industry retirement home. Madden spends most of his days wandering around Los Angeles watching old movies playing at the Beverly Cinema, and taking hits off of a bottle of Wild Turkey bourbon. Flash is in the process of slowly drinking himself to death because he has other unnamed health problems, most likely cancer. Cameron gets around on his bike. Cameron desperately wants to make a short film over the three week Christmas holiday break to compete in a student film competition, but is continually thwarted by another student Bret Raven (Taber Schroeder) from a wealthy family who considers Cameron a low life and just laughs at his ambitions. And this is with some justification. 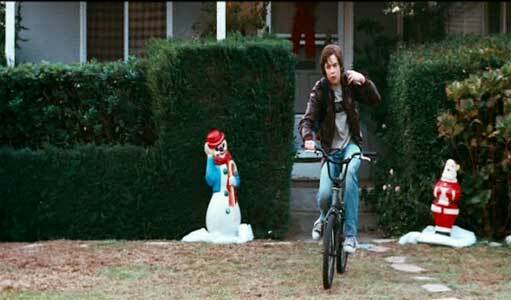 Cameron and his only friend Murphy have been in trouble with the authorities joy riding in a car that was used to make the film Christine, and Cameron doesn’t have enough money to put on a serious effort. Bret’s dad works in the film industry and has money and clout to help Bret out even though Cameron has more talent and knowledge about films. When Cameron fights back at Bret for nearly running over him in his car, and rides his bicycle over Bret’s expensive sports car, Murphy tells him, “Are you crazy?” Cameron replies, “I did it because he acts like we don’t matter.” Murphy tells him, “It’s true. People like us don’t matter in the big picture.” Murphy has a point. To add to his woes, Cameron has a pretty miserable home life with a stepfather (George Murdock) who doesn’t like him, and his mother (Mimi Kennedy) caught in between. 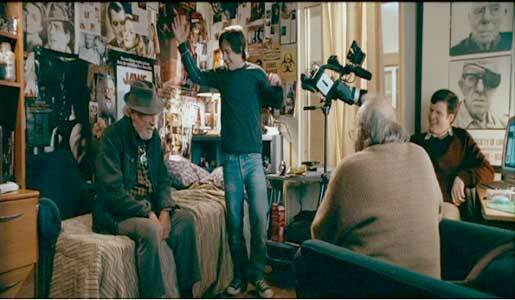 Cameron enlists the aid of cranky retired gaffer Flash Madden to help produce his film. Cameron first runs into Flash at a film screening of A Touch of Evil, when Flash mouths off during the showing and other customers complain and leave. Flash’s knowledge of the films is immense and he shows of his technical knowledge when the camera showing the film breaks down and starts burning. He got his start and his nickname “Flash” from working on a project with Orson Welles. Realizing that Flash could really help him with his film project, Cameron makes a point of tracking Flash down, and slowly persuades Flash to help him with his project. It takes a number of visits, because Flash, true to his nature, tells Cameron to get lost and leave him alone. But eventually the promise of good cigars and whiskey is tips the balance, and Flash decides to help Cameron. When Cameron pitches his first script idea to him, which is a film about skateboarding, he doesn’t really get very far. So Flash decides to get him some help from other retired people he knows. He takes Cameron over to meet Mickey Hopkins (M. Emmet Walsh), who at one time was a first rate screenwriter with impressive credits. But now Mickey lives by himself in a run down apartment, abandoned by his daughter, who won’t even talk with him on the telephone. 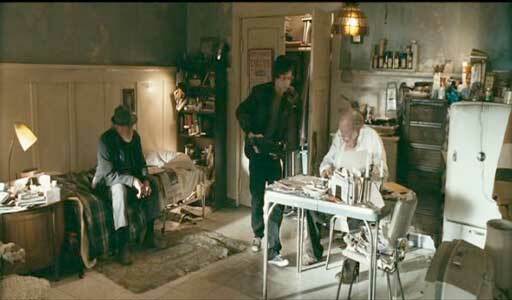 Eventually, Cameron settles on an expose of poor conditions in senior retirement homes. Mickey has no idea of how to start researching until Cameron shows him the Internet. Then it becomes a slam dunk. Mickey ends up writing a crackling script. The preproduction process goes so well that Flash takes him to meet a retired producer Taylor Moss (Robert Wagner) who he figures owes him because his ex-wife ran off with Taylor many years ago. And Taylor puts up $5,000 and the project is under way. Much of the plot line from this point on covers familiar territory. Flash and Cameron end up bonding, the film gets made with the help of a lot of the people in the retirement home, and Flash even has a talk with Cameron’s stepfather. There are a few twists and surprises, but this film is primarily a character study. Flash and Cameron work on getting veteran sreenwriter Mickey Hopkins to write the screenplay. Writer/Director Michael Schroeder emulates the look of a student film in places and the camera work probably uses too many effects and hand held shots for this film to have a “mainstream Hollywood” look to it. Sometimes the edgy camera work just seems unnecessary. The thing that makes Man in the Chair work is the fabulous performances by the actors. This truly is one of Christopher Plummer’s best performances ever; he dominates the screen from start to finish. Quite a jump from the Captain in The Sound of Music, but this kind of a role is what Plummer excels in, an edgy character with a big mouth and a mean streak but underneath a heart of gold. There is a whole subplot in this film that doesn’t make a lot of sense when placed with the rest of the film but makes sense because Plummer, who loves dogs, is in the film. (Plummer owned seven golden retrievers named after the von Trapp children in The Sound of Music.) Flash often spends part of his aimless days sitting across from the animal shelter watching with resentment as he sees the daily roundup of stray dogs being brought in. You know that he wants to go in one day and let them all go free again. Flash, Cameron, Mickey, and Murphy celebrate the completion of the shooting. M. Emmet Walsh deserves an award for even taking on the role of Mickey Hopkins; this role was too painful for many other Hollywood actors to handle. The pathos of his life is revealed in so many ways. He presents himself so poignantly as a relic from another era, now cast away by the same system that made him a top screenwriter at one time. There are also some great cameo performances by some of the other people in the retirement home who are so energized when they get a chance to work on Cameron’s film. Great filmmaking is truly a team effort, and some of the most interesting scenes are when you see the elderly team at work. It was a pleasant surprise to see Robert Wagner in his role as a retired Hollywood producer. You really can tell he has been in the business as he gives us that perfect producer attitude in his few scenes. Michael Angarano has his work cut out for him working with Plummer and the other long time pros. He is most effective when he is the film student with a passionate knowledge of the film genre, less so as the juvenile delinquent. 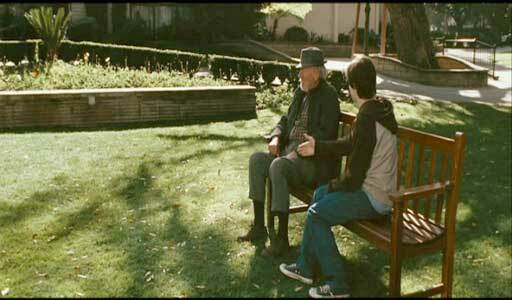 As a character study and as a look at Hollywood, Man in the Chair is an enjoyable film to watch. It has won a number of awards at independent film festivals. It’s too bad that this film didn’t get proper backing for theatrical distribution. Hopefully it will get released on DVD soon for the general public. 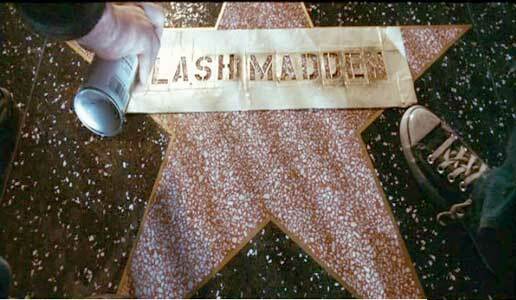 As a tribute to Flash Madden, Cameron and Murphy paint his name on a sidewalk of fame star in Hollywood. Michael Angarano in his role as the young filmmaker Cameron Kincaid wears black high top chucks throughout the film. It’s the perfect look for him. Early on in the film you see them in the bike scenes when he is tracking down Flash Madden to try and persuade him to help on the film project, perhaps an analogy for all of the footwork that Cameron is going to have to do to get his project finished. 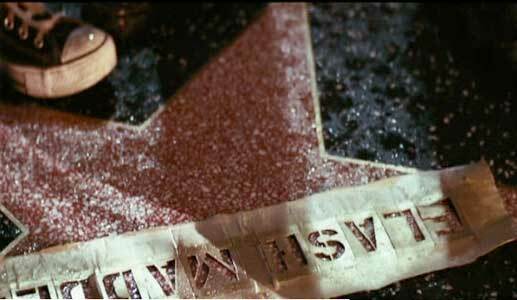 The best closeup shots are at the end of the film, when Cameron and his friend Murphy give Flash his own star on the Hollywood Walk of Fame. Murphy sprays on the name while Cameron watches. Man in the Chair. (2007) Christopher Plummer, Michael Angarano, Joshua Boyd, M. Emmett Walsh, Robert Wagner, Taber Schroeder, Mitch Pileggi, Mimi Kennedy, Ellen Geer, George Murdock, Allan Rich. Written and directed by Michael Schroeder. Categories: Comedy, Drama, Coming of Age.